National Express will have its East Anglia rail franchise terminated three years early, the government has said. The Department for Transport said National Express would lose the franchise on 31 March 2011. 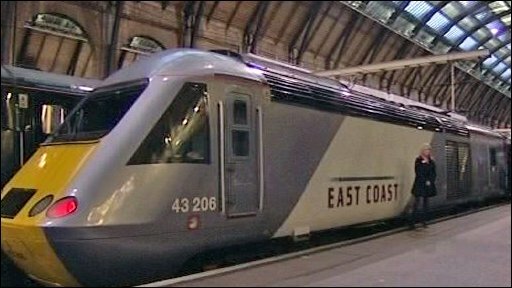 It could have been extended until 2014 had National Express not defaulted on another franchise - the East Coast Main Line - earlier this year. National Express said the decision was "expected", but that it was "disappointed" by the announcement. Transport Secretary Lord Adonis said the process for securing a new operator would start immediately so that a new franchise could begin in April 2011. East Anglia services run between London's Liverpool Street station and eastern England destinations, including Peterborough and Norwich. In July this year, National Express said it would be seeking to hand back the East Coast rail franchise early. The company had agreed in 2007 to pay £1.4bn over seven years to run the line, but this amount turned out to be too much and the government refused National Express's requests for its contract to be renegotiated. Since 14 November, the East Coast franchise has been run by a state company, East Coast, who will manage the line until November 2011. After National Express gave up its East Coast franchise, the government had said it was "unacceptable" for the company to go on running its other franchises - East Anglia and c2c, the London to Tilbury and Southend line. Earlier this week, the Department for Transport announced a bidding timetable for the c2c franchise, which is up for renewal in May 2011. "In determining the future of the c2c and NXEA franchises, my overriding concern has been to minimise disruption to passengers and staff, and cost to the taxpayer, while ensuring that train companies stand by their commitments," he said. "However, my judgment is that the public interest would not be served by terminating the franchises immediately, necessitating state management during the refranchising period and three operators in two years." In a statement, National Express said: "Whilst this decision was expected given the event of the default of the National Express East Coast franchise, the company is disappointed given the excellent improvement in performance delivered by the group over the past five and a half years of operating the franchise." The Rail Maritime and Transport (RMT) union said the latest franchise failure underlined the "continuing chaos of rail privatisation". "We are calling on the government to seize this golden opportunity to take National Express East Anglia back into public ownership, and for the sake of both passengers and staff we are delighted that the company's days as a train operator are well and truly numbered," said Bob Crow, RMT general secretary.